Will Ryback Finally Emerge As The WWE's New Big Man? Will Ryback Finally Emerge As The WWE’s New Big Man? Has the WWE replanted the seed that will finally see the Ryback experiment come to fruition? After a stellar performance at the Payback pay-per-view on Sunday night, the “Big Guy” may have finally gotten over with the fans as a wrestler who should be taken seriously – as a contender and not an over-sized pretender. All it took was a couple of years of seasoning and a big push from Bray Wyatt to make the Ryback experience seem like it will finally work in the WWE – a proposition that Vince McMahon hoped for a couple of years ago when CM Punk was the ruler of wrestling’s free world. We all know Vince McMahon’s philosophy of what is bigger is better for the business. That is why Hulk Hogan stayed on top of the WWF/E food chain for so long. That is why it took some convincing that wrestlers like Daniel Bryan, Shawn Michaels, Eddie Guerrero and CM Punk could carry the promotion despite their size and stature. When McMahon saw Ryback, a repackaged former member of Nexus, he saw dollar signs. Feed McMahon More! In reality, the experiment is beginning to pay off and Sunday night, we saw the fruits of everyone’s labor in what can only be described as Ryan Reeves’ best outing yet in a pay-per-view. Yes, Bray Wyatt had something to do with that. 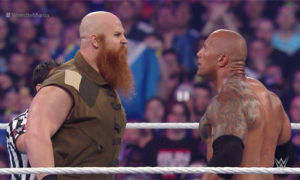 In this case, it is the kind of feud that Ryback needs – a prolonged program that can make him the superstar the company and fans have wanted him to be. All too often, wrestlers work a few matches, stretch a feud into a pay-per-view and are done and move on. Wyatt has been involved in many solid feuds, most notably with Undertaker and John Cena. I thought the Ryback angle was more of a demotion, but this was created in a way to show how Wyatt’s character and his ability to carry a wrestler has been best used. This time, the WWE struck gold with Ryback – FINALLY. There have been other big men in professional wrestling who have struck quickly and have been successful. Batista and Goldberg come to mind. Both had solid title runs in their careers. Ryback isn’t there yet. And if I can draw the comparison, the WWE did its best to push the Ryback proposition down the throats of the WWE fans much like they have done lately with Roman Reigns. Fans are adjusting to Reigns as a wrestler who has been on the grand stage and isn’t quite ready yet. The same can be said for Ryback. But both will be there in a short amount of time. Now that we have been teased with his fluidity in the ring, his ability to talk better on the mic and the expectation that he can hold his own in a program, the WWE better not be quick to rush Ryback into headline status. That might be harder now given that there isn’t a lot of room at the top. The mid card is exactly where he should stay for a while. Maybe challenge someone like King Barrett or take a run at Sheamus if he wins the Intercontinental Title at Elimination Chamber. But in the meantime, let him continue to work his program with Wyatt and see if the small amount of success leads to bigger things. If everything continues to move forward and Ryback shows he can handle the bigger stage, then he can fulfill McMahon’s wish of the “bigger is better” prophesy. That means in the future, and only in the future can the WWE feed Ryback more and determine if it’s an appetite he can digest.